Request a quote for a bulk order for 5-methylcytosine (5-mC) monoclonal antibody for ICC/IF - Classic. Please fill out the form here below. Your local sales account manager will get in touch with you shortly and send you a quotation based on your requirements. 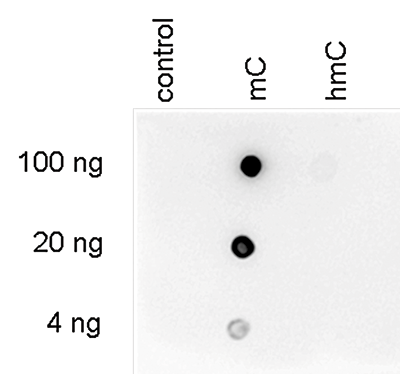 Monoclonal antibody raised in mouse against 5-mC (5-methylcytosine) conjugated to BSA. Human, mouse, drosophila, other (wide range): positive. To demonstrate the specificity of the Diagenode antibody against 5-mC (Cat. No. C15200003), a Dot blot analysis was performed using the hmC, mC and C controls from the Diagenode “5-hmC, 5-mC & cytosine DNA Standard Pack” (Cat. No. AF-101-0002). One hundred to 4 ng (equivalent of 5 to 0.2 pmol of C-bases) of the controls were spotted on a membrane (Amersham Hybond-N+). The antibody was used at a dilution of 1:600. Figure 1 shows a high specificity of the antibody for the methylated control. HeLa cells were stained with the Diagenode antibody against 5-mC (Cat. No. C15200003) and with DAPI. Cells were fixed with 4% formaldehyde for 10’ and blocked with PBS/TX-100 containing 1% BSA. The cells were immunofluorescently labelled with the 5-mC antibody (middle) diluted 1:1,000 in blocking solution followed by an anti-mouse antibody conjugated to Alexa594. The left panel shows staining of the nuclei with DAPI. A merge of the two stainings is shown on the right. Human osteosarcoma (U2OS) cells were stained with the Diagenode monoclonal antibody against 5-mC (Cat. No. C15200003). Cells were fixed with 2.5% PFA in PBS for 30’, permeabilised with 0.5% Triton X-100 for 1 hour and treated with 2N HCl for 1 hour followed by 2 x 5 minutes with 0.1 M borate buffer to depurinate the DNA. After blocking with PBS containing 0.1% Triton X-100 and 1% BSA, the cells were immunofluorescently labelled with the 5-mC antibody diluted 1:500 in blocking solution, followed by a goat anti-mouse antibody conjugated to Alexa488. Figure 3A: cells were immunofluorescently labelled with the 5-mC antibody after incubation of the antibody with 50 µM mCTP (left) or with DAPI (right). Figure 3C: staining of the cells with the 5-mC antibody after incubation of the antibody with 50 µM hmCTP and with DAPI. To detect methylated chromosomal regions, FISH was performed on metaphase chromosomes from HeLa cells using the Diagenode monoclonal antibody against 5-mC (Cat. No. C15200003). The cells were blocked in metaphase by treatment with colcemid (0.1 µg/ml) for 1 - 2 hours, fixed overnight at -20°C with ethanol/glacial acetic acid and treated with 2N HCl for 30’ at room temperature. Subsequently, the cells were blocked with PBS containing 1% BSA and 0.1% Triton X-100 and stained with the 5-mC antibody (left) diluted 1:1,000 in blocking solution, followed by an anti-mouse antibody conjugated to Alexa594. The middle panel shows staining of the chromosomes with DAPI. A merge of the two stainings is shown on the right. Diagenode strongly recommends using this:	5-methylcytosine (5-mC) monoclonal antibody for ICC/IF - Classic (Diagenode Cat# C15200003 Lot# 003). Click here to copy to clipboard. Delatte B, Wang F, Ngoc LV, Collignon E, Bonvin E, Deplus R, Calonne E, Hassabi B, Putmans P, Awe S, Wetzel C, Kreher J, Soin R, Creppe C, Limbach PA, Gueydan C, Kruys V, Brehm A, Minakhina S, Defrance M, Steward R, Fuks F.